The taste for adventure and exploration, no matter how brief, is pretty strong following our recent visit to Cornwall. Much like everyone else last weekend, we headed for the coast down south. The traffic was pretty horrendous and it took us a few hours to get down there, but once Eastbourne was below us and with the weather feeling pretty fine, I think we'd realised the fresh sea air and the walk along the clifftops would do us some good. 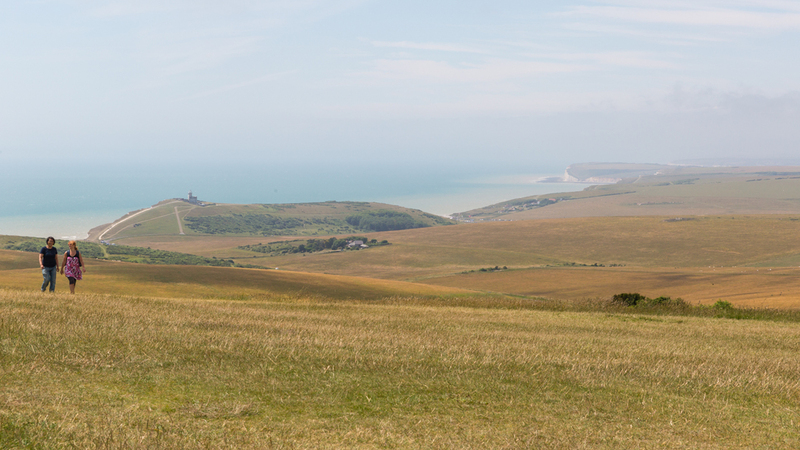 Visibility was patchy, but you could still get a pretty good view across the South Downs to other parts of the coast. It was nearly a year ago now when we came down to this part of the world to see the coastline and the Seven Sisters, and on in the distance to the east of us, we could just about make out the chalk headland. I have always been fond of and intrigued by this particular lighthouse, and I have seen many photographs and paintings with it featured, but never having known where it was when I was younger. Lighthouses make me feel happy – they remind me when I used to watch Round the Twist as a kid. As I got older, I soon learned that this particular place is a well-known spot where people have come to end their lives – it's one of the most notorious suicide spots in the world. There is however a great chaplaincy team at work here that does regular patrols around the area, along with the local police, to reach out to those in need. The folks at the local pub keep their eyes and ears peeled too. The great thing about the summer is that we just love to get outdoors when we've both got the free time to do so. If you can get out into the countryside or down onto the coast, a nice walk in good weather costs nothing, and you feel great afterwards, especially if you're from the City! Trust me! Lastly, you can donate to the Beachy Head Chaplaincy Team at bhct.org.uk.